Bettinita Harris began writing in 1979 as a newspaper reporter and editor. She has worked at "The Tampa Tribune," "The Star Tribune" in Minneapolis and "The Philadelphia Inquirer." She is an American College of Sports Medicine-certified personal trainer who works in the Philadelphia area. She has a Bachelor of Science in journalism from the University of Kansas. 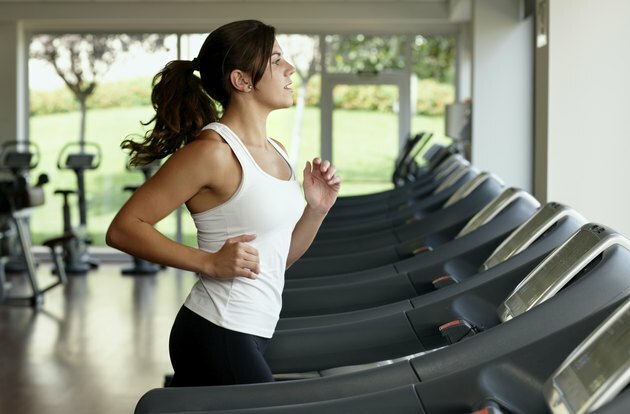 If you are trying to lose weight and you have a choice of using a treadmill or a stationary bike to exercise, select the treadmill, because you will burn more calories. Walking and running are weight-bearing exercises that engage more muscle mass than non-weight-bearing activities such as cycling. When performed at the same intensity level, a person engaging in weight-bearing exercises will burn more calories, says the American College of Sports Medicine. Stationary bikes are safe and they provide an effective form of aerobic exercise. Biking strengthens lower body muscles, including the quadriceps, hamstrings and calf muscles. In addition, you can boost the exercise’s intensity by increasing the pedaling resistance. Many stationary bikes include electronic workout programs that simulate hill climbing, interval training and speed work, along with keeping track of time, distance and calories used. Because biking is low impact, there is less trauma to muscles and joints. Still, you are not working the whole body when exercising on a stationary bike, says the American College of Sports Medicine, or ACSM. One of the most popular cardiovascular machines is the treadmill. It is convenient and many models offer a variety of built-in electronic walking and running programs. These programs can simulate virtually any kind of workout involving walking or running and can measure calorie expenditure, time, distance and other key aspects. This kind of weight-bearing exercise, in which the body is in motion during exercise, not only burns more calories, it helps to maintain bone mass and prevent osteoporosis. You can make any treadmill workout more challenging by increasing the treadmill’s speed or grade. But the higher speed and incline levels also increase the risk of injury to your feet, ankles, knees and back. Besides how many calories you can burn, there are other factors you should consider when deciding which exercise machines to use. These include personal preferences, fitness goals, physical ability, health status and availability of equipment. Key among the factors is doing an exercise you enjoy. The more you enjoy an exercise, the more likely you will continue to do it on a regular basis, notes the ACSM. While exercising on a treadmill will burn more calories than riding a stationary bike, both modes of exercise produce health-related benefits, such as reducing disease risk, building and maintaining healthy muscles, and promoting feelings of well-being. Furthermore, cross training on different exercise machines reduces the risk of overuse injuries and wards off boredom. If your primary goal is to lose weight, the best approach is to jump on the treadmill, get your entire body moving and burn those calories. Walking or running on a treadmill are exercise modes that virtually anyone can do. According to ACSM, the key to weight loss is finding and maintaining a consistent intensity level for treadmill workouts and following a schedule of five to six workouts a week lasting at least 30 minutes each. ACSM's Guidelines for Exercise Testing and Prescription; Walter R. Thompson, Ph.D., et al. ACSM'S Resources for the Personal Trainer; William R. Thompson, Ph.D.,et al.